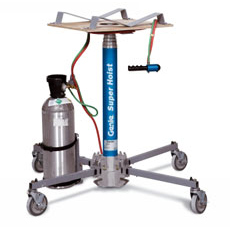 GENIE Model GH-3.8 SUPER HOIST Material Lift - Material Lift Sales, Inc. SHOWN WITH CO2 TANK AND PLATFORM CRADLE, NEITHER INCLUDED IN BASE PRICE. Flat Platform with 19″ x 24″ surface. Reverse side has bracket to wrap hoses for storage and transport. Hand Control Assembly has 16 ft long hoses with Quick-Connect Fittings. Pressure Regulator with Quick-Connect Fittings mounts on CO2 Tank. Captive Legs with 6″ Swivel Casters. Positive easy-to-release locking mechanism. Platform Cradle Package: Vee-shaped brackets are used to lift pipe.